The USAID-funded Kandahar Food Zone (KFZ) Program uses a unique system of an integrated software tools to build a robust project information system. 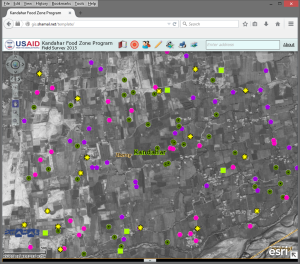 The combination of advanced geo-spatial analysis tools with information sharing and collaboration tools has received high praise from program staff, the donor, other implementing organizations and Afghan Government Ministries for its ability to support state of the art analysis and share the results across the diverse stakeholder community. As well as being an information exchange platform, Shamal is an integral part of the KFZ program workflow. It is used extensively in program activity selection, design, implementation, monitoring, evaluation and reporting. The results are strong, evidence-supported management decisions and program reporting for high levels of accountability, responsiveness and technical accuracy. The system is comprised of eight core functional areas: Geographic Information System & Associated Applications; Document Management; Project Management; Reporting Dashboards; Data Management Engine; Field Data Collection; Training Resource Portal; and Web Service Applications. While these are widely incorporated in similar systems, the real power of Shamal lies in the automated “back office” part of the system that links the different system component software programs together to talk to each other in real time between different coding languages, instantly sharing, updating, analyzing and processing data to produce a “meta data” resource library. The System is constantly evolving to meet new program needs under the direction of the chief system architect and analyst, Dilip Wagh who serves as the KFZ Director – Shamal Information system and Ligia Carvajal, the KFZ Chief of Party.